The quest to end Mercury Morris’s reign of terror continues on Sunday night as a pair of unbeaten teams faceoff. It’s old (Manning) vs. kind of new (Rodgers). It’s an off-shoot of an aging Muhammad Ali vs. the younger, brash champion Larry Holmes. It’s not Super Bowl XXIV 1/2 between the 10-1 Giants and the 10-1 49ers, but I’ll take it. The 6-0 Packers at the 6-0 Broncos. 8:26 – As this is happening, the New York Mets are trying to stave off elimination in Game 5 of the World Series. Updates or lame You Tube videos to come. 8:30 – Kubiak vs. McCarthy. This has the potential to be a coaching disaster, right Al? 8:35 – Peyton throws to some dude named Bennie Fowler. You’ve never heard of him so that’s why it doesn’t end in a first down reception. Punt time for the Broncos short of midfield. 8:39 – Packers ball. Rodgers is already dancing around in the pocket like he is in a 1984 Michael Jackson Pepsi commercial. 8:43 – Green Bay doesn’t generate anything on the first drive. One point of concern…Rodgers is already getting hit a fair amount. 8:47 – Denver’s next drive features running aplenty as it lands them in Green Bay territory. 8:52 – Peyton sets up a first and goal with 30-yard throw to Demaryius Thomas. Ronnie Hillman caps the drive with a one-yard touchdown run. For the first time this season, incredibly, the Broncos score a touchdown in the first quarter. 8:57 – Let’s see if GB responds quickly. As great as Rodgers is on the move, I’m not sure that would make me a happy man if I’m Mike McCarthy. 8:59 – Rodgers has some time albeit uncomfortably but nobody is open. PUNT. 9:04 – Captain Omaha and the Broncos are already in check down mode as the first quarter comes to an end. 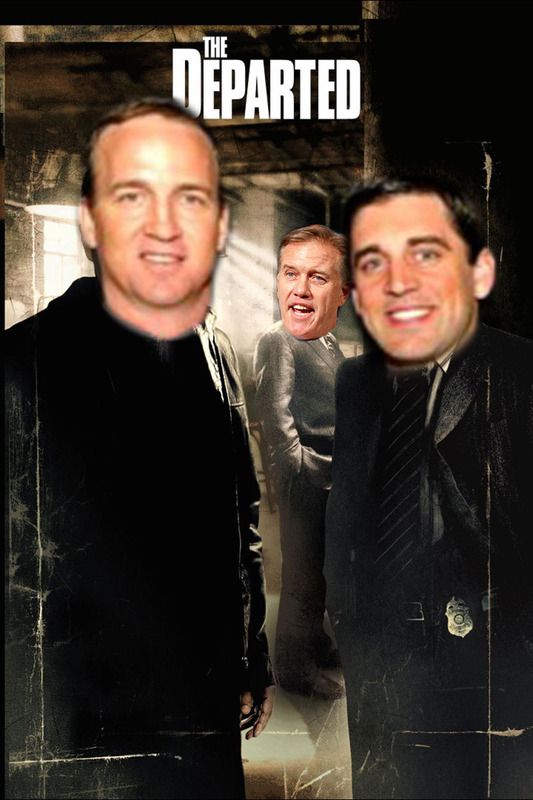 Peyton’s got to protect that lead y’all! 9:06 – This is always going to be the most famous regular season meeting between the Broncos and Packers in Denver. Check out the weather from this 1984 Monday nighter. 9:08 – He must have read that end of quarter update. Peyton takes a long shot downfield for Thomas and connects inside the GB 10. Manning to Caldwell for 6 on Denver’s super-awkward bootleg play but Caldwell gives the defender a two-handed push, which draws a flag for OPI. 9:10 – Not to fret Ronnie Hillman scores again after the OPI on a 15-yard romp. 9:11 – 85 yards in six plays. Oof. 9:14 – People kept saying the Packers will not miss Jordy Nelson because Aaron Rodgers is the Mona Lisa of QBs…WELP. Nobody is getting open. 9:16 – Packers run it on 3rd and 2…and miss. Three and out. Yikes. 9:20 – Here comes Michaels and Collinsworth with the whole “we told you Peyton Manning isn’t washed up” angle. If his arm isn’t fresh off a bye week, he should retire now. 9:22 – Man, Ronnie Hillman is out here running like 1996- 98 Terrell Davis. Not a good sign for the Packers. 9:24 – Denver tacks on a 50-yard field goal to increase their lead. Packers might want to show a pulse at some point tonight. 9:31 – Green Bay has the 22nd ranked pass offense in the NFL while being led by Captain America. Sip on that for a second. Meanwhile, the Packers are at midfield. 9:33 – Von Miller is down with an injury for Denver. Good lord. It feels like he gets hurt every season. 9:35 – Al alerts us that it is cramps. 9:38 – Alas, Green Bay joins the game thanks to a personal foul call off a Rodgers throw. The Pack takes advantage with a short touchdown run by Eddie Lacy. 9:44 – Denver with the ball deep in their own end near the two-minute warning. It’s going to totally blow if this game is a blowout. 9:47 – On a 3rd and 4, Manning converts a third down. EVERYTHING IS BETWEEN THE HASHES. GUARD THE HASHES, GREEN BAY. 9:52 – Seemingly on their way to another score, Denver picks up a rash of penalties including an illegal hands to the face call and can’t convert a 3rd and 31. 9:55 – Denver’s drive accomplished one thing. Rodgers couldn’t get back onto the field. Alas, sulking Rodgers in full effect as the first half ends. 10:04 – At the half, Denver honors owner Pat Bowlen…one of the NFL’s greatest owners. Here’s to you, Mr. B. 10:10 – Good lord. Denver’s D at home is mega-fast. Packers look like they are running quicksand. 10:18 – A holding penalty sabotages Green Bay’s drive in Denver territory. They’ll try a 56-yarder to salvage it…and they do. Nicely done, Mason. 10:20 – This is not good news for anybody. MRI shows Steelers RB Le'Veon Bell "badly tore" his MCL. Bell is done for the year. Major blow to Pittsburgh’s chances for a deep playoff run. 10:24 – In a matchup of Zombie Peyton Manning vs. Dom Capers (GB’s defensive coordinator), I’ll take Zombie Peyton everytime. He hits on a 3rd and 8 to a drive moving. 10:27 – Clay Matthews is out after getting an ankle rolled. Ronnie Hillman is out for the moment with an injury. The ghost of CJ Anderson is in to help out matters. 10:29 – Speaking of….he goes 28 yards to the house right through the middle of the GB defense. 10:35 – The best Rodgers completion is typically the one where is jumping into the throw tonight. Just brutal. 10:38 – Why are the Packers running toss plays with Lacy against this defense? Makes zero sense. 10:40 – Green Bay uses their second timeout of the half. Rodgers gets sacked on 2nd and 9 and miss a 3rd and 17. It’s not their night tonight. 10:46 – CASSEL. BRADFORD. SUNDAY NIGHT FOOTBALL. NEXT WEEK. Can we extend the World Series to 15 games? 10:47 – Speaking of the World Series, Mets lead 2-0 in the bottom of the eighth. Here is an excuse to post one of my favorite baseball plays of all-time. 10:49 – Meanwhile, Denver is rolling downfield against the Packers. Inside of the GB 20 again. 10:50 – Michaels and Collinsworth now acting like nothing was wrong with Peyton prior to this game and that this resurgence has nothing to do with him having a bye week. 10:53 – Denver adds on another field goal. 10:56 – Rodgers gets sacked, fumbles, and it’s recovered in the end zone by GB…but you know what that means. 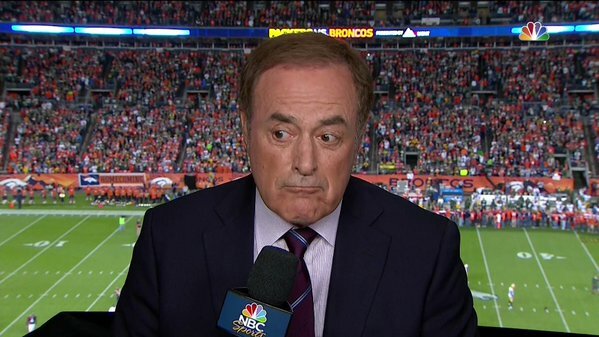 DeMarcus Ware just caused a safety. 11:07 – Your highness throws his 11th interception of the season. However, the Packers get stonewalled again…punt time. 11:12 – Denver is running all over the Packers…still. CJ Anderson is almost making everyone forget how awful he was at the beginning of the season. 11:14 – Anderson…13 carries, 104 yards , and a TD. Broncos are over 500 yards of total offense while they are closing in 200 yards rushing. 11:16 – Al and Collinsworth have just resorted to making pizza and pot jokes. That’s where we are tonight with this one, folks. 11:21 – Scott Tolzien alert tonight. Rodgers heads out with just 76 yards passing tonight. Holy ghost. Thankfully, this one is over. Summary: Very, very, very interesting. Going to ask a controversial question here. Are we sure GB is the best team in the NFC? Granted, I’m not sure who it is besides them but do you feel super comfortable with them against anyone in the playoffs considering one of their most reliable options is James Jones? As for Denver, they were a legit AFC contender before entering this game….and they’re a legit AFC contender leaving it. That will do it. PINK FLOYD AND VAN MORRISON….take me away!